We are very thankful to Jeremy Bourne and his family for opening the grounds of Church farm house for the Fete. It is with great sadness that we lost Jean Talbot earlier this year and her absence will be keenly felt by everyone involved in the organisation of the Church fete. We will be dedicating this year to her memory and making a special mention of her life in the programme. Church farm House is the oldest surviving house in Barton Stacey with some part having recently been identified as being of early Medieaval origin – probably salvaged from the original manor house. We are honoured to hold our Fete here. Both the house and Garden Wall are Grade II listed. We believe it was one of the earliest “flat pack houses” built at Bucklers Hard from old ships timbers and shipped to Barton Stacey to be built on site. There is lots to see but look out for the “Fire Insurance Marks” and the Saxon or Medieval ‘cats head’ which can just be seen on the sides of the house. 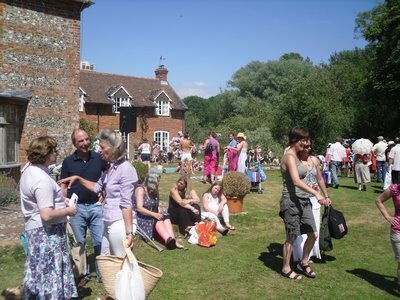 We have held the Fete at Church Farm House for the last few years. Before that it was at Wades House. However in the 1930’s and 40’s we know our fete was held at Church farm.